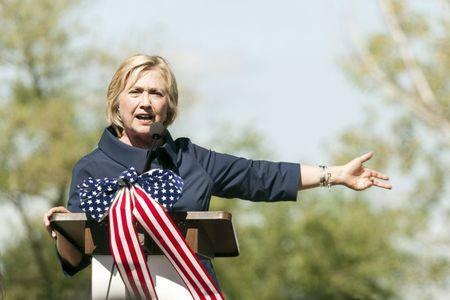 NEW YORK (Reuters) - Democratic presidential front-runner Hillary Clinton told the Associated Press in an interview on Monday that she did not need to apologize for using a private email account and server while secretary of state because what she did "was allowed." She also called the emails controversy "a distraction" that had not affected her campaign plans or her message. But she added that separate private and public email addresses would have been a "better choice." "I have worked really hard this summer, sticking to my game plan about how I wanted to sort of reintroduce myself to the American people," she was quoted as saying in the interview. Clinton's use of her private email for her work as America's top diplomat from 2009 to 2013 came to light in March and drew fire from political opponents who accused her of sidestepping transparency and record-keeping laws. The private account was linked to a server in her New York home. Clinton has said the unusual arrangement broke no rules that were in force at the time, although critics have said it has caused long delays in providing federal records to lawmakers and the public. The FBI is examining Clinton's server to see whether information was mishandled. No evidence has emerged suggesting Clinton's email practices harmed national security. "What I did was allowed. It was allowed by the State Department. The State Department has confirmed that," Clinton said in the AP interview.